Spanish PM Mariano Rajoy says he will ask the courts to revoke a law passed by the Catalan regional government to hold a referendum on independence. He described the vote, planned for 1 October, as illegal. Earlier, state prosecutors said they would bring criminal charges against Catalan leaders for their endorsement of the referendum. 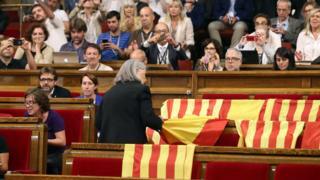 The pro-independence majority in Catalonia's parliament passed the referendum law on Wednesday. Spain's wealthy north-eastern region already has autonomous powers but the regional government says it has popular support for full secession. "What is not legal, is not democratic," said Mr Rajoy. He described the law as an "intolerable act of disobedience" and said the constitutional court would be asked to nullify it. Mr Rajoy added that all local councils would be warned of their "obligation to impede or paralyse" any effort to carry out the vote. Chief prosecutor José Manuel Maza told reporters he had asked security forces to investigate what preparations, if any, the Catalan government had made to hold the referendum. He said his office would present criminal charges against members of the Catalan parliament for voting for the referendum, and against members of the Catalan government for signing off on it. The Catalan government has a majority in the regional parliament made up of the separatist Junts pel Si (Together for Yes) coalition and the left-wing CUP party. Using the hash tag #josigno, mayors around Catalonia have been posting photos of themselves on Twitter signing official declarations of support for the referendum.